The Epson EcoTank (ET-2500) printer was recently released. In response to this news, Aaron Leon, CEO of LD Products, one of the largest U.S. online retailers for all office supplies – and the absolute largest for aftermarket ink and toner – set out to educate consumers on the difference and costs of buying ink up front versus over two years. 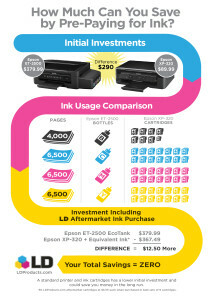 In doing this, he compared the Epson ET-2500, which has a refillable ink reservoir and comes with bottled ink that Epson says will last consumers about two years, to an Epson XP-320, which comes with standard ink cartridges and would, for the next two years, be stocked with aftermarket ink. To help people visualize Leon’s comparison, LD also provided the attached infographic. His comparison is as below. *Number adjusted slightly down to account for a new printer’s included starter ink cartridges that are already partially filled. It would take approximately 50 ink cartridges, 7.7 black and 14 sets of color cartridges, to equal the amount of ink in the tanks that come with the ET2500. 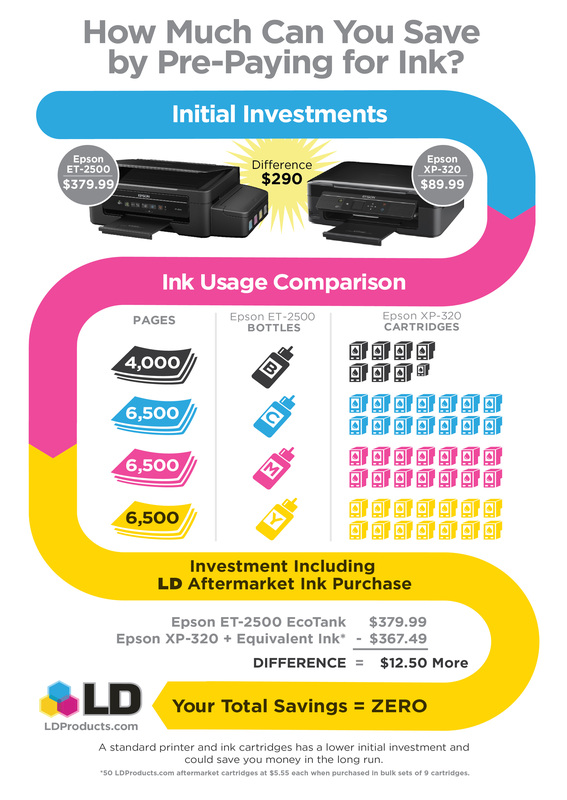 If you take the upfront investment for the ET2500 of an additional $290 and divide that number by the 50 ink cartridges if would take to equal the same amount of printer pages, you get a cost per Epson cartridge of $5.80. LD aftermarket cartridges are $5.55** each when purchased in a bundle. Aftermarket cartridges are still cheaper and don’t require consumers to pay $290 extra up front when buying a printer. There are advantages to Epson’s new concept, such as not having to change printer cartridges as well as getting original equipment manufacturer (OEM) ink. However, buying the regular printer and aftermarket ink allows consumers to save money and spend money on ink as they need it. A similar comparison would be buying a car for $15,000 or the same car for $40,000 with two years’ worth of gas inside. **LD aftermarket cartridges are $5.55 each when purchased in a bulk set of 9 cartridges.